Sell Bitcoin to PayPal? How is this possible? This is the complete guide to selling your Bitcoin to PayPal with 15% markup and converting your Bitcoins to USD or local currency in your PayPal account. There are other guides showing how to sell Bitcoins to PayPal, but none of them discuss how to sell at a 15% markup to the current market price of Bitcoin. Link your xCoins account to PayPal wallet and select your settings for buyers. You can then use the funds in your PayPal account as usual, for online purchases or cash out to your bank account. Steps 1-3 take perhaps 15-20 minutes to complete. 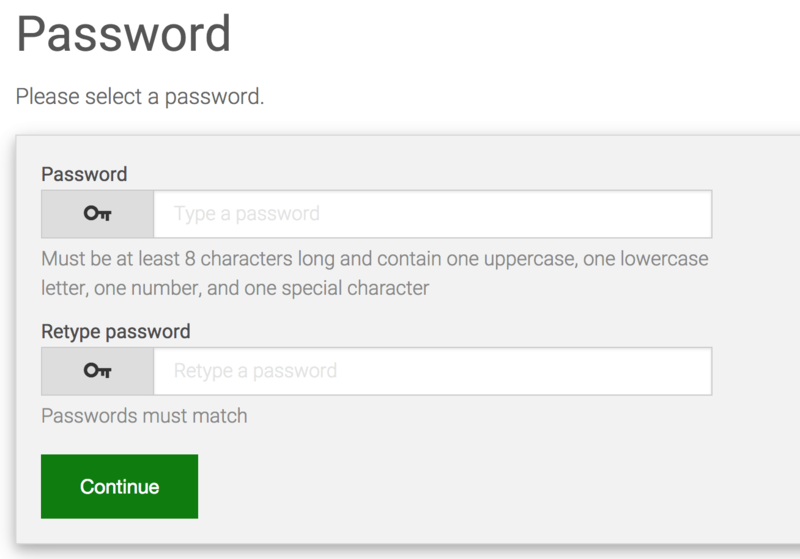 Steps 4 -6 are completely automated. 3. 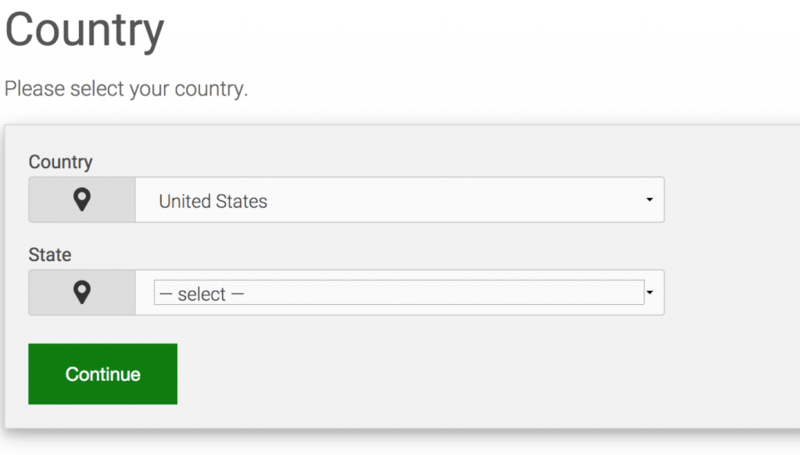 Link your xCoins account to PayPal wallet and select your settings for buyers. You may need to verify this in your email inbox. Go to your Bitcoin wallet – you may have Bitcoin at an exchange such as Coinbase, Kraken, Poloniex or an offline wallet on a computer or USB drive. 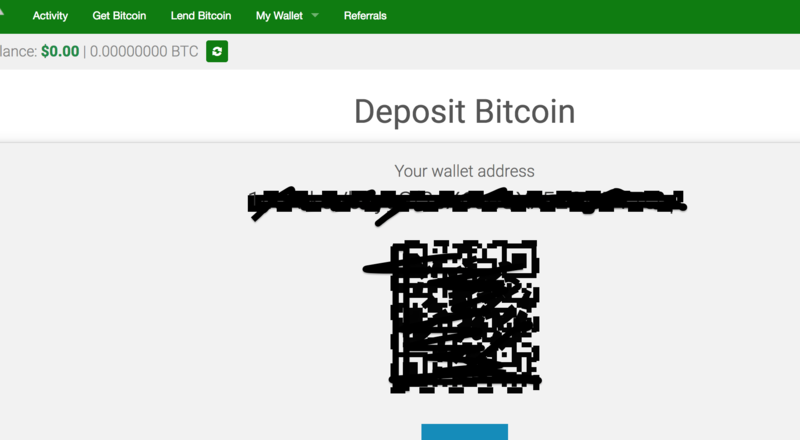 Send a small amount of Bitcoin first to the address you just copied from above, to test that everything works correctly! When the first transaction shows up in the xCoins wallet, feel free to deposit as much as you like. Note: due to the delays currently being experienced on the Bitcoin blockchain, the deposit will likely take at least 30-40 minutes to appear in your xCoins wallet. This is nothing to do with xCoins, it affects all users of the Bitcoin blockchain. Don’t worry, it will arrive eventually. Next, you need adjust the settings which affect what kinds of buyers can actually purchase your Bitcoin. Below is a screenshot with my settings, feel free to adjust according to your own risk appetite. Be aware that Rating refers to the number of times a buyer has used xCoins – so 1 = 1 first time buyer (higher potential for PayPal disputes or chargebacks), 2 = second time buyer (much lower risk), and so on. Steps 5 and 6 – waiting for your Bitcoin to be sold and receiving USD or local currency from the Bitcoin sale into your PayPal account are completely automated. That’s it! You can also use xCoins to continuously earn passive income with Bitcoin. Posted in bitcoin investment, bitcoin lending, bitcoin to paypal, passive bitcoin, passive income bitcoin on May 22, 2017 by Patrick. How does the idea of generating a passive income, involving a relatively small monetary investment, a few minutes of your time per week, and seeing an income stream coming back to you within a day or two of your first investment? Sounds too good to be true? Well, it’s actually possible, and doesn’t require taking on huge risks or having access to special skills or knowledge. How? By passively investing with Bitcoin. The below method is a very effect way of selling Bitcoin to PayPal, and get a 15% markup over the current market price of Bitcoin at the same time. Purchase bitcoin on an exchange. Deposit your newly purchased Bitcoin into a Bitcoin lending service. Wait for your Bitcoin to be fully lent out (this step is 100% passive). Return to step 1 – lend your initial amount, plus fees, so your investment grows steadily. 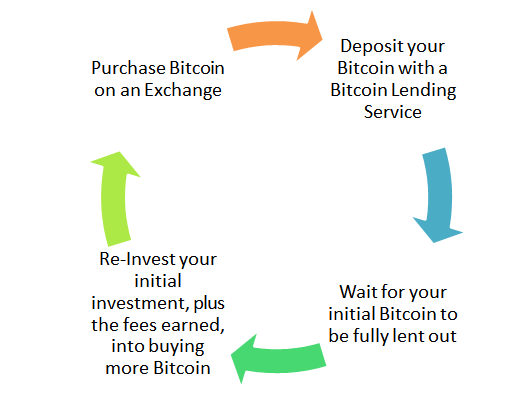 As you can see, the process is very simple, and doesn’t take much time: buy Bitcoin, deposit it in a lending service, wait for your funds to be lent out, then take your initial investment plus fees, and use that to buy more Bitcoin, lend it out….and so on! You Bitcoin isn’t released until someone actually sends payment via PayPal, so your funds are fully protected during this process. By the way, the terms “borrowing” and “lending” Bitcoin are somewhat misleading, is more accurate to say that you are buying Bitcoin at the market rate, and selling it with markup. If you are not sure what Bitcoin is, I highly recommend this short introductory video: What is Bitcoin? Passive income has been a relatively loosely used term in recent years. Colloquially, it’s been used to define money being earned regularly with little or no effort on the part of the person who’s receiving it. Bitcoin is Highly Volatile – How Does this Qualify as “Low Risk Passive Investment”? The beauty of lending Bitcoin is that you are exposed to very little price volatility because you only own Bitcoins for a short period of time – between the time you purchase the Bitcoin and the time it takes someone to “borrow” them for you on the Bitcoin lending exchange (they pay the market value of the Bitcoin, e.g. $100, plus some fees on top, which is what makes it so attractive for you as an investor). Usually, large Bitcoin price movements take several days or weeks to play out, so you are exposed only to smaller price movements. If you buy $100 worth of Bitcoin on Monday, usually you’d expect to have most of it lent out by Wednesday, with the cash on its way back to you in your PayPal account, ready to be reinvested back into lending out more Bitcoin. How much can I Make Passively Investing in Bitcoin? Let’s run through an actual loan to use as an estimate of how much you can make in fees, and plug those numbers into a spreadsheet. 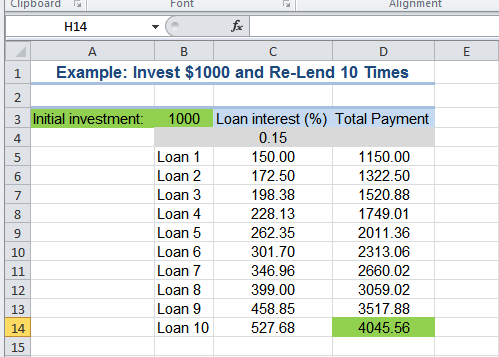 Using these fees, I plug some hypothetical numbers into a spreadsheet to see what I could make from a $1000 initial investment, which I then loan out ten times (reinvesting all the initial amount plus the fees, so that the investment compounds nicely). I ignore the PayPal transaction fee that’s paid by the buyer, as obviously that part of the payment doesn’t go back into my pocket. Note: expect most loans to be in the $30-$100 range, you are not going to lend out the entire $1000 at once. Not bad for just a few minutes per week of your time! By loan 5, we have already more than doubled our initial investment! How long it takes to loan out your full $1000+ is difficult to say, as it depends on the amount of borrowers at any given moment of time. Surely There are Some Risks and Drawbacks? Yes, of course. There is no such thing as a free lunch after all. Apart from the risk that Bitcoin’s price could dramatically shift at very short notice, the other main risk is the fact that you are using PayPal- which in recent years has become riddled with scammers due to their crazy policies that favour buyers over sellers. This means that in the event of a dispute, PayPal will often favour the buyer over the seller (even where blatant fraud has taken place). The other main risk is that the buyer can initiate a credit card payback via PayPal, meaning that PayPal will charge you a fee to cover their loss, even if PayPal sides with you in a dispute. You have to carefully consider these risks before getting involved with Bitcoin lending. Personally, I think the risk is worth it, even if I have to occasionally deal with some annoying borrower who suddenly decided they don’t want their Bitcoin, even though it’s already in their Bitcoin wallet and they decide to complain to PayPal. What’s in This for Each Person? For you, the lender – you generate a low-risk, low-time commitment side income. How much and how often you invest is 100% your choice – if you need funds back, you can cancel your lending at any time, sell your Bitcoin and cash out. For me, the author of this guide – I make a small referral fee when you sign up to these services – at no cost to you. Also, I enjoy spreading the word about Bitcoin and cryptocurrencies, so it’s enjoyable for me to bring more people into the world of Bitcoin. Ok – I’m Interested! How do I do this? These steps can take a few days, depending on how smoothly your ID verification is processed with the Bitcoin exchange, how quickly your initial deposit takes, and how much borrowing activity is going on at any give moment. The good news is you only need to do this once. Step 1. Signup to a Bitcoin exchange. This is where you buy Bitcoins which you will then lend to someone else. I highly recommend Coinbase* as they’re really easy to use and come highly recommended. You’ll pay a transaction fee for using a credit card to buy Bitcoin, however if you live in a SEPA (Single European Payment Area) country, you can actually deposit your investment without fees. Note that you need a passport or other form of photo ID to open an account with most Bitcoin exchanges. *Note: if you sign up to Coinbase with this link, you get $10 in free Bitcoin when you buy your first $100 or more worth of Bitcoin from Coinbase! Step 2. Signup for a PayPal account, if you don’t already have one. Step 3. Signup to the Bitcoin lending website, this is the service that matches lenders and borrowers of Bitcoin. The service I use is Xcoins. Wait for your funds to be lent out – can take several hours to several days, depending on the amount you are lending, and the demand at the time. This is 100% hands-off, so no work for you! Personally I like to log in once every few days to check my balance and to check for messages (in case of problems), but how often is completely up to you. You will also receive email notifications regarding your transactions, so you don’t even have to login every time. Return to step 1! Purchase your initial amount + your 15% profit, and reinvest to steadily increase your profits over time. I’ve gotten some questions on reddit on this passive income method. Question 1. What exactly is going on here? Why are people “borrowing” btc, secured with more cash than they are borrowing? The amount in cash + fees + interest is immediately in my PayPal. Why would people do this? People are paying for the speed and convenience. If you’ve ever tried to register for a Coinbase account, you’ll understand the hassle it takes (take a photo of your passport with your phone or webcam, the software inevitably fails to recognise it or you did something wrong, takes 1-2 weeks+, back and forth with the support staff to sort it all out so you miss out on the latest price increase or whatever). 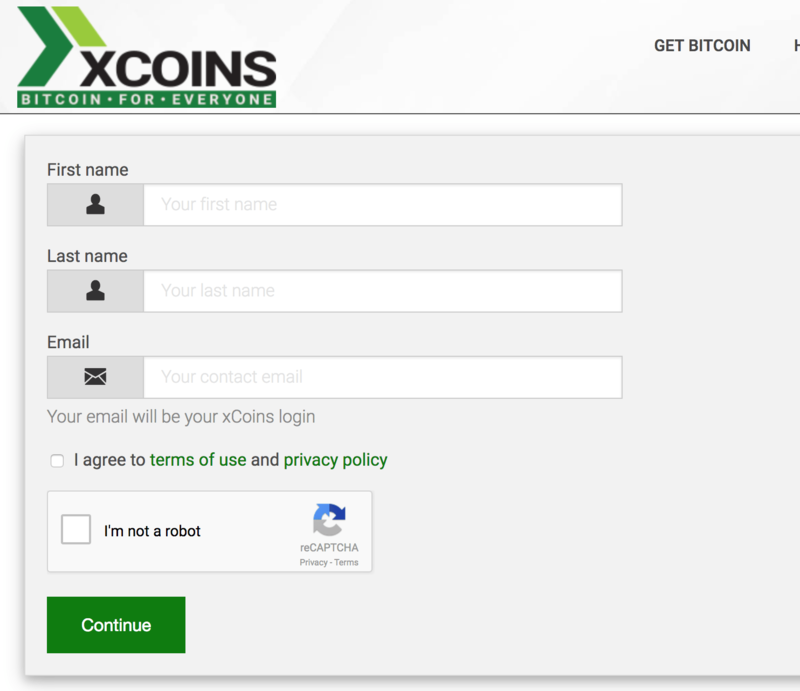 Xcoins does this part manually if I had to guess, which dramatically speeds it up. You can also purchase BTC with cash via localbitcoins, but this is a hassle for many people and it’s a legally grey area depending on your country. Question 2. Am I laundering money? Absolutely not! There is a record of all transactions on Paypal, credit card statements and on the Bitcoin network, which makes this a terrible way to launder money. Question 3. Do any lenders even care to be repaid? It seems like both parties would walk away from the transaction after the initial exchange. No, as a lender you don’t care about being “repaid” despite the marketing material on the site 😉 The part that’s interesting is selling at a markup, and being able to repeat this over and over (“walking away” from the transaction each time). I think it’s described like this on the site to avoid calling themselves a p2p exchange or equivalent. Basically you can keep purchasing BTC via Coinbase (or any other exchange of your choice) and repeat as often, or as little as you like. In Coinbase you can set a recurring purchase amount, e.g. 100/1000/X amount every week, and then simply login once a week and transfer the BTC to your lending wallet (takes probably 2-3 mins max). Then is lent out automatically, you make 15%, you get the USD funds in Paypal….buy more in Coinbase…send to lending account….and so on. Question 4. You mention that it’s passive. So, I have people’s money in my PayPal. Do I just purchase more btc from Coinbase or someone with that money and repeat the process? 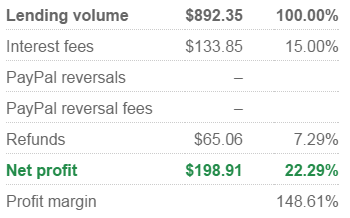 When you get paid via PayPal you can simply cash out the profits into your bank account, or buy more BTC and reinvest. That’s what’s so great about this strategy, your funds are not locked up for long periods – the money is yours once it hits your PayPal account! (The only exception is fraud, which sadly happens every now and again, which I mention above). Question 5. How would I report this on my taxes? I strongly advise talking to an accountant or tax advisor for your country. It probably fits in a tax category similar to an item that you flipped for a profit on eBay. Question 6. How much do you think you should invest in flipping Bitcoin? Usually it takes 1-2 days to full sell ~$150-$200 worth of BTC (it depends on the demand at any given time). You can start with a minimum of $20 though, so try that to get a feel for how it works. You can always buy and loan out more if you wish. Question 7. How long have you been doing it for and what has your ROI been? Roughly two years or so. ROI is tricky because when I cash out with Paypal, I get completely screwed with their USD to EUR exchange rate. You officially make 15% per transaction though if you’re cashing out to USD, assuming your don’t get with hit with too much fraud, your ROI will be around that. It’s not risk-free, but it’s far easier and less stresful compared with trading, since you don’t have to actively do anything once you setup your loans. Find out why using xCoins is an effective way of cashing out Bitcoin to PayPal. Posted in best, bitcoin investment, bitcoin lending, bitcoin to paypal, extra income, guide, passive bitcoin, passive income, passive income bitcoin and tagged best passive income cryptocurrency, btc loan, crypto passive income, earn bitcoin passively, make passive income with cryptocurrency, passive bitcoin faucet, passive btc on December 22, 2016 by Patrick.